Once a month–the last Friday of every month, a challenge is issued and the participants have exactly one week to imagine, design, and execute a finished piece. I haven’t always been able to participate but decided to try harder this year. February’s challenge involved interpreting spring using complementary colors. I’m not sure my piece meets this criteria except for the spring green grass in the front. I used pre-fused pieces and Sulky cottons along with some hand-dyed cotton thread. 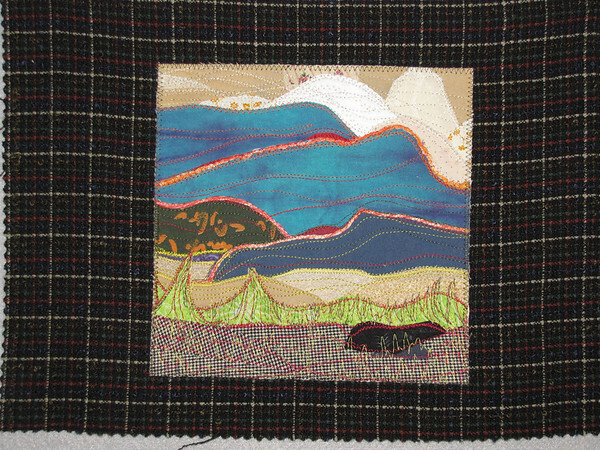 It is mounted on a piece of black plaid from the give-away pile at the local quilt guild. I’m not sure what I’ll do with it–maybe put it on a notebook.